Do you painstakingly arrange them into albums? Do you save them to an external hard drive? 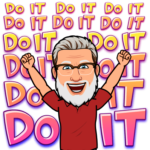 Or do you use an app like Google Photos? Smart phones make it easy to take gorgeous photos and videos on the go. However, the prolific nature of photography has created an urgent need to organize and store our memories. I’ve been using Google Photos for a while and it’s made photo management a much easier (and more pleasant) experience. 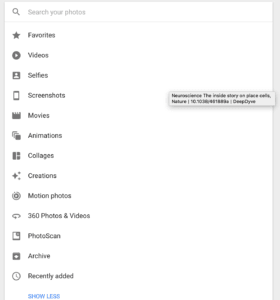 Five Google Photos features in particular really take this app to the next level. They’ll save you time and make photo management less painful. Photos are important. They are memories given form. That’s why it’s a good idea to keep spare copies. Backing up your Google Photos is easy to do but it doesn’t happen within the app itself. Under Privacy and Security, click on Control my content. Then, click on Create archive. 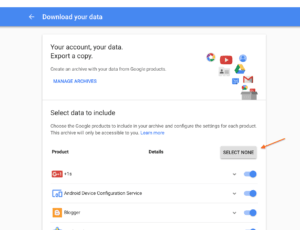 From here you can back up all your Google data. If you just want to select your photos, click on Select none then scroll down to Google Photos and toggle that on. You can download specific albums or go ahead and back up all your photos. To do that, scroll to the bottom of the page, select Next and create an archive. Once Google has created your archive, you’ll get an email letting you know when you photos are ready for download. From there you can download the zip files and save them to your computer or transfer them over to an external hard drive. Thanks to machine learning, Google Photos’ search and ability to “understand” photos is incredibly powerful. Let’s see it in action. Google does a phenomenal job of pulling out the photos that fit your search queries. You can use it to search for people, animals, objects or locations. 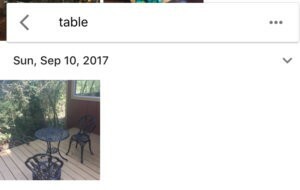 When I searched for “table”, Google came back with images of tables, people sitting at a table and even a hard-to-recognize image of a cake on a table. But Google’s AI isn’t satisfied with being able to pick tables out of a line up. You can also use it to sort out your photos based on format. Formats include selfies, screenshots, and collages. Both the search and sorting functionalities make managing your photos much easier. They eliminate the need to invest hours into manually organizing your albums. One of the most futuristic, and useful, features of Google Photos has to be facial recognition. The Google AI goes through your photos and picks out people’s faces. You can then go through the faces and link them to your Google contacts or manually add the names. That way when you search for an image of “Dave” all pics of Dave you’ve stored to Google Photos will come up. The Google AI is determined to be able to recognize Dave at all times– even if he’s wearing a fake mustache and glasses. So when Google comes to two different images of what it thinks is the same person, you’ll see a little notification asking you to confirm (or deny) its conclusion. This improves the app’s accuracy and makes it really easy to bring up all the photos with a specific person up in a flash. This saves a lot of time scrolling through looking for that stunning pic of your parter you took last summer– you can just type their name into search and voila. How much phone memory do your photos take up? Mine take up a fair bit. Google Photos makes it easy to free up memory. You can set the app up so that every time it’s got access to wifi, it syncs and backs up your photos to the cloud. With your photos safely stored, you can delete the duplicates from your phone and free up memory. Google Lens is a new, and very exciting, feature of Google Photos. Select a photo and Google Lens will try to identify what it is. It works especially well for architecture, famous art works, plants or dog breeds. 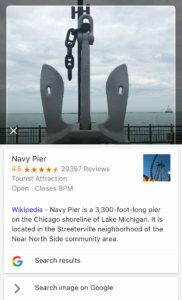 When I run this pic through Google Lens, Google immediately identified it as Chicago’s Navy Peer and gave me a couple of links I may find useful. So if you’ve no idea what breed your neighbor’s new pup is (but don’t want to ask again) just snap a pic and run it though Google Lens. The ubiquitous nature of having a camera in your hands at all time has caused an explosion in the number of photos we take. Imagine how many hours we’d spend moving pics from album to album if we had to sort it out by hand. AI-powered tech like Google Photos search makes staying organized easy. I know that it saves me hours of management every week. 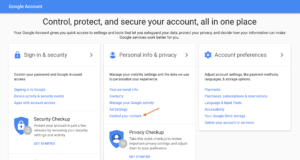 Do you use Google Photos to organize your images? Let me know in the comments below!